So far only a partial shot of the F-Pace has been released. The crossover will be available in major global markets starting next year. Jaguar Design Director Ian Callum believes that company founder Sir William Lyons would approve of the first crossover in the automaker’s 80-year history. “He would think it’s absolutely right,” Callum said when speaking about the F-Pace at a press event on Sunday evening ahead of the opening of the Detroit auto show. Callum also explained how Jaguar came up with the crossover’s name. He said that the “F” is used to link the crossover to its halo model, the F-Type, referring to the F-Pace as Jaguar’s “family sports car.” The executive said that “Pace” pays homage to the brand’s founding ideals of Grace, Pace and Space. The automaker showed an example of those three words being used in a vintage Jaguar print advertisement. Callum said that the objective when creating the F-Pace was to make sure that the automaker didn’t try to wrap a Jaguar around the traditional dimensions of a crossover. “We wanted to build something with true Jaguar DNA,” he said. The design boss said that Jaguar wants to make sure the F-Pace maintains the spirit of the well-received C-X17 crossover concept it debuted in 2013. He said that more detailed photos of the F-Pace would start to appear in the next few months. So far only a partial shot of the F-Pace’s rear taillight has been released. 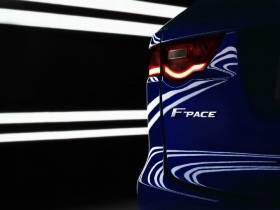 The F-Pace is scheduled to be available in all major markets by the first half of 2016. Along with the new XE midsized sedan, the crossover is expected to boost Jaguar’s global sales to more than 200,000 by 2018, up from 81,570 last year.